Participate in Acme Fresh Market’s Community Cash Back program! Acme is donating 5% of your receipt to Paws and Prayers! Drop off receipts at any of our public events! Click here to view our calendar. Drop off receipts at our office, any day between 10 am and 4 pm. Address and instructions here. Mail receipts to our P.O. Box! P.O. Box 67166, Cuyahoga Falls, Ohio, 44222. 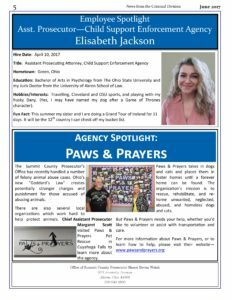 Check out our feature in the Summit County Prosecutor’s June newsletter! Download the full newsletter here. Paws and Prayers Pet Rescue added 6 new photos.